It is extremely exciting to announce a series of events taking place on either side of the Irish Sea during November 2017. 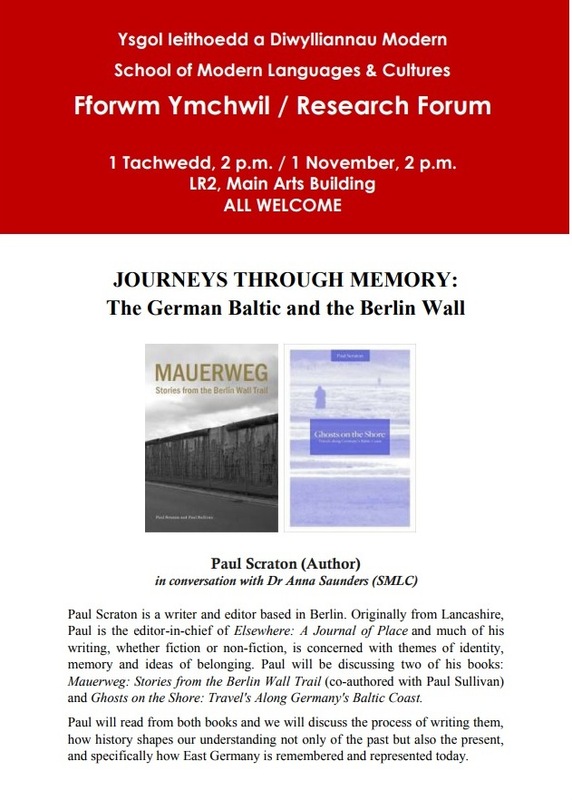 I will be talking to Dr Anne Saunders about the German Baltic and the Berlin Wall at an event that is free and open to all on Wednesday 1 November at 2pm. We will be talking about the writing of both Ghosts on the Shore and Mauerweg (co-written with Paul Sullivan). I will be reading from both books and there will be a Q&A. Marcel is the author of the upcoming Babushka’s Journey and we will both be reading from our books, talking about our travels through central and eastern Europe and discussing the related themes in Babushka’s Journey and Ghosts on the Shore, from family memory to how we tell the stories of the past. I am really pleased to have been invited to take part in the third event as part of the new multidisciplinary arts project in Ireland exploring “the corridor” between Dublin and Belfast. I will be talking about the importance of borders and how we explore them in our writing with novelist and short story writer Evelyn Conlon, my good friend and fellow walker-writer Marcel Krueger, and Garrett Car, author of The Rule of the Land: Walking Ireland’s Border. Marcel and I will bringing our discussion from Tuesday in Dublin to Belfast on Thursday (via our Dundalk interlude along the corridor) at the ever-wonderful No Alibis bookshop. We will once more be talking about both our books as well as giving a reading and answering (hopefully interestingly) any questions you might have. On Friday 24th November, I will be sleeping. This entry was posted in Diary, Reading on October 19, 2017 by Paul Scraton.